These delicate biscuits use a mixture of glacé fruit and nuts in a sweet honey caramel, generously coated in bitter dark chocolate. Preheat the oven to 170°C. Butter a baking sheet. Finely chop the mixed glacé fruit, orange peel and cherries and place in a bowl; add the sliced almonds. Tip the flour into the bowl and stir carefully by hand to separate the pieces of glacé fruit. Using a teaspoon, put small mounds of the mixture on the baking sheet placing them well apart. Flatten with the back of the spoon into thin 3 cm discs. Transfer to the oven and when the discs start to bubble, remove and cool for about 30 minutes. Lower the oven temperature to 160°C and bake the discs for another 10 minutes. Cool and transfer to rack. Temper the chocolate: Coarsely chop the chocolate. Place 2⁄3 (200 g) of the chopped chocolate in a bowl; melt over a bain-marie until the temperature reaches 45°C on a cooking thermometer. Remove the bowl from the heat and add the remaining chocolate, stirring until the temperature drops to 27°C. Return the bowl to the bain-marie, stir gently and reheat the chocolate to 32°C. Using a pastry brush, apply a layer of tempered chocolate to the flat side of each Florentine; tap each one on the work surface to release any air bubbles in the chocolate. Spread with a second layer, using a spatula to remove any excess chocolate. 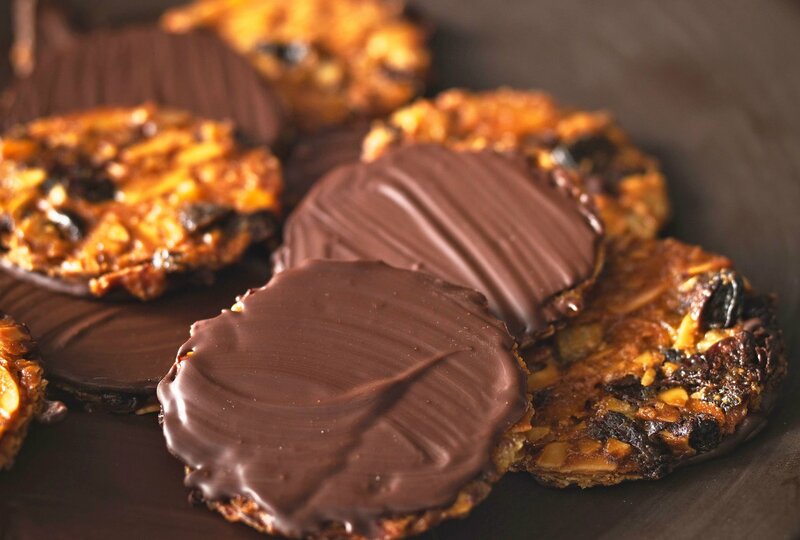 Harden the Florentines at room temperature.